Begin with a rich color scheme of red, black, and gold and add in traditional accents. Asian decor is very sleek and minimalist. 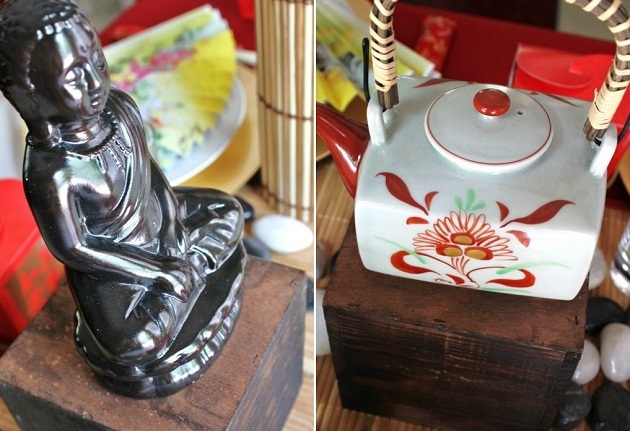 For the centerpiece I simply used dark wooden boxes as pedestals to hold decorative items – a Buddah statue, and a tea pot from Japan (my husband brought back for me from a business trip). A glass cylinder vase is wrapped with a bamboo placemat and filled with a palm plant and sculptural branches. A few river rocks on the table add a Zen feel. Many items are readily available to create an Asian tabletop: lovely fans, chopsticks, and take-out boxes provide instant ambiance. Your menu doesn’t have to be difficult to make. Try my Asian Noodle Salad served with chicken satay. Take out food from your favorite restaurant is perfectly acceptable for this type of party, as well as prepared appetizers like dumplings or vegetable sushi rolls from the grocer. An obvious choice for dessert or favors is a take-out box filled with fortune cookies. Get these in the Asian section of the grocery store and set at each place setting to add to the overall decor. Want more Travel theme ideas? Check out my Mexican Fiesta, my Havana Nights party, and a Moroccan inspired baby shower. So, what do you think? Is there a travel themed dinner party you would love to host? Leave a comment and let us know – maybe I’ll be inspired to create some ideas for it! Ohhhhhhhhhhh what fun! Great styling! !